Outlook OST Repair Software is compatible with Windows 10, 8.1, 8, 7, XP, Vista, 2012, 2008, 2003, 2000 versions. OST Recovery software supports MS Outlook 2000, 2003, 2007, 2010(32/64 bit), 2013 (32/64 bit), 2016 (32/64 bit) versions and repair OST file of 32 as 64- bit. 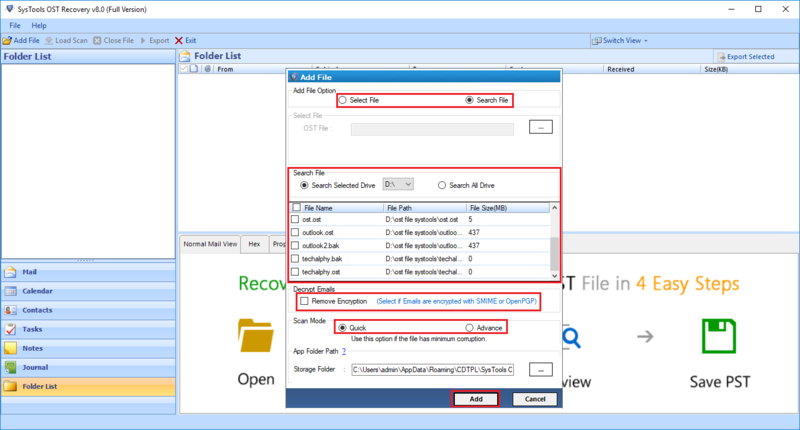 The FreeViewer Outlook OST Recovery Tool can easily recover all the file's items which are permanently deleted. It helps in the restoration process of mailing items from Offline Storage files i.e., address books, calendars, deleted mails, to-do lists, journals etc. After complete recovery process, it stores the resultant data to PST files and then the users can access files in Microsoft Outlook easily. Additionally, the OST files can be repaired of any size using the OST File Recovery software. After repairing OST file, a user can easily extract Outlook OST data file to many file formats like MSG, PST, HTML, & EML with an option of naming convention to save emails properly. After conversion process, all the data are accessible to Outlook, Outlook Express, WLM and other email clients. The utility allows a user to split the large sized PST files in order to avoid the issues of file size corruption. The OST Repair tool needs to put the desired size and then divide Outlook PST files. 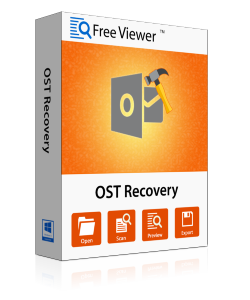 FreeViewer OST Recovery software can remake an instant view of the report of all the components of Offline OST Storage files such as Tasks, Emails, Notes, Contacts, Journals, Calendars, etc. via item count of the items. The software mails the data in normal view with associated attachments. Additionally, the utility also keeps all the Meta properties like To, Bcc, Cc, receive date, sent date, and much more than it is. The tool even retains the original format of Outlook OST file and also remains as it is in the process of OST File Recovery. The utility even allows the users to select only the desired emails and items that are mandatory. The user does not need to choose the mails of the Offline Storage files to perform the repair and transfer process. Users can store desired mails/items from repaired Outlook OST files by selecting mark/unmark option towards the respective items. After completing the entire process, then the users need to hit on Export. Using this option, all the desired files will be extracted. However, all the specific files/folders can be chosen with this OST Repair Software. Exchange OST Repair Software has the credibility to restore OST files using the scanning option provided by the tool. It is even possible to recover the corrupted files which are highly corrupted. Henceforth, the tool comes up with two scan options to scan the files. First one is Quick Scan and the second one is Advanced Scan. The Quick scan option is used for repairing a small amount of the corrupted files. In addition to it, the advance scan option, users can also repair all the files regardless of the total amount of corruption. The software even maintains the internal structure of folder/folders of Offline Storage files while exporting the files to PST format. OST Recovery maintains the export process and there will be no changes, in the files after completion of the entire process. In addition to it, the hierarchy of files and folders has been maintained. 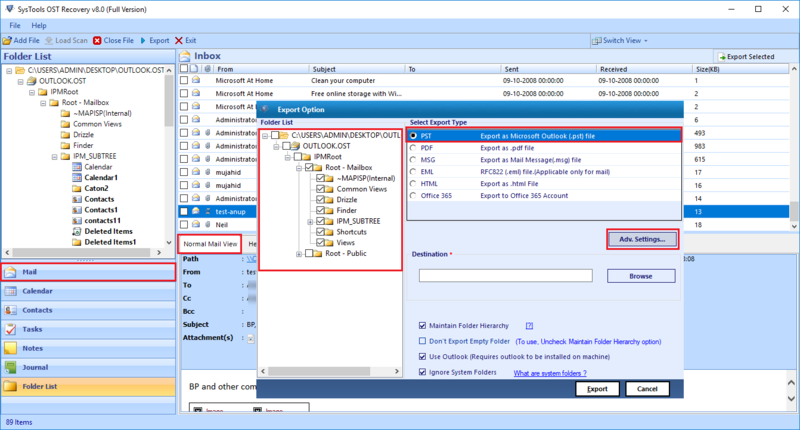 Along with this, it becomes easy to extract the specific Outlook OST data files using the help of Date Range filters. Yes, once the date filter is applied to the emails, users can extract only the desired files. Demo Version of OST Recovery Software Can Only Preview Recovered Data & Export 25 Items/Folder into PST, EML, MSG, Office 365, HTML. Note: To Export OST Contacts, Calendars, Tasks, Notes, Journals into PST format, Check 'Use Outlook (Outlook must be installed)' option on Export Option Window. For Windows 10/8.1/8/7 or Vista users, launch the tool as "Run as Administrator"
Support OST File Repair of 32-bit & 64-bit. Explain the functioning of OST Recovery Tool? Step 1: Install & run the Outlook OST Repair Tool. Step 2: Click on Add File and browse OST file from your system. Step 3: After adding the file, the software will scan the file and shows the preview of all the data items in the file in different view panels. Step 4: You can select data items and then click on Export button to export recovered OST file into PST, Office 365, MSG and EML file formats. Step 5: Apply filters for selective data conversion and then proceed further. Step 6: After the complete export process, the tool will generate an Export Report which shows all the details of the data items that have been exported. Step 7: You can also save that file in CSV format and open in excel sheets. Step 8: At last, you can navigate to the destination location and view the converted file. You can also import those files to Outlook & Office 365. Does the OST Repair application export the data without being present in Microsoft Outlook arena? Yes, users can perform the complete recovery process and then export files without the use of Outlook. Can the utility repair OST files that are being highly corrupted or accidentally damaged? Yes, Exchange OST Recovery program provides an alternative to restore the highly corrupted OST files via Advance Scanning option. Is it possible to retrieve deleted emails from OST by using the OST Repair software? 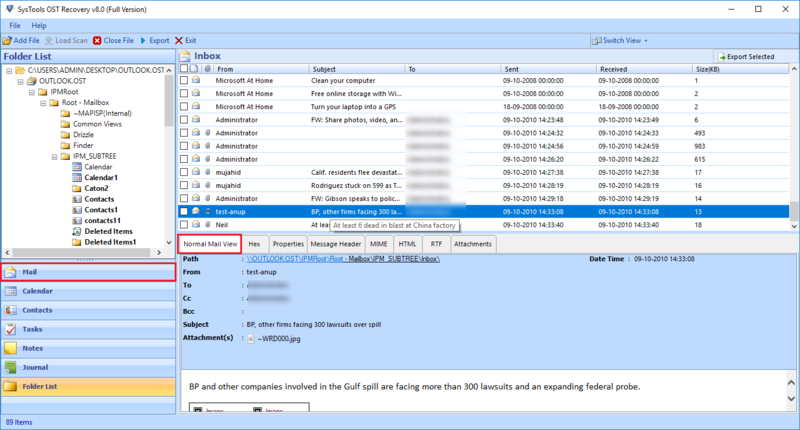 Yes, using OST Repair Tool, the users can even recover or restore Outlook OST messages that are being deleted accidentally. Is it necessary to install MS Outlook for converting files to PST with OST Repair Utility? No, it is can be proclaimed as a standalone tool & it does not require Microsoft Outlook pre-installed to perform the entire conversion. Are there any restrictions imposed on the tool when it comes to OST files repair and recovery process? No, Outlook OST Recovery program can repair and recover as many OST files as you want without any limitation. Is it possible to repair emails and contacts from Outlook 2016/2013/2007/2003 using OST Repair Tool? Yes, it is possible to recover and extract the emails and contacts from MS Outlook using our OST Recovery software of any editions. "I haven’t ever come across such an amazing utility that can resolve all the issues related to OST. The OST Repair Utility is one of the best approaches to easily solve all the corrupt OST related problems. I must appreciate your work guys. You are magicians." "Thank you, Team! For such an amazing product. The OST Recovery tool is a marvelous approach to recover OST Files related issues. In addition to it, the tool has many amazing functionalities that make it different from all the repair tools." "I must say that the tool is really amazing! I have never found such tool that can actually do a lot of things. It recovers Outlook OST file as well as export to many file formats like PST, Office 365, EML & MSG that are compatible with many other email clients. This makes FreeViewer OST File Recovery tool different from others." "I got an important task from my senior to recover old OST files. I was not familiar with the methods to so. Then, he suggested me to use FreeViewer OST Recovery software. I used this tool to complete my task. This utility took very less time to complete my task. It was a great experience of using this software!"